My brain doesn’t really retain much info lately. I get easily overwhelmed and lose track of pretty much everything. A while back I rediscovered the bulletjournal and after some initial try-outs in my Hobonichi Cousin I found that the A5-size currently doesn’t work for me. Too big or too heavy, not sure which one(probably both), but my hands and wrist start hurting a lot when I use it. The Cousin now lives on my desk and I don’t spend time at my desk anymore. I purchased a pocket Leuchtturm1917 notebook (in ‘Berry’, a nice warm pink) and luckily, my previous experience with a (several years old) Leuchtturm notebook proved non-standard. That notebook feathered and bled through like crazy! Several people told me (and showed photos) of their current notebooks, and those didn’t bleed much if at all, and no noticeable feathering. So I took the plunge and it paid off. The pocket size (close to A6) fits my pocket (any pocket!) and bags easily and feels very light. After using it for a month I added a small Quiver to it, even though I had also stuck a penloop on it already. 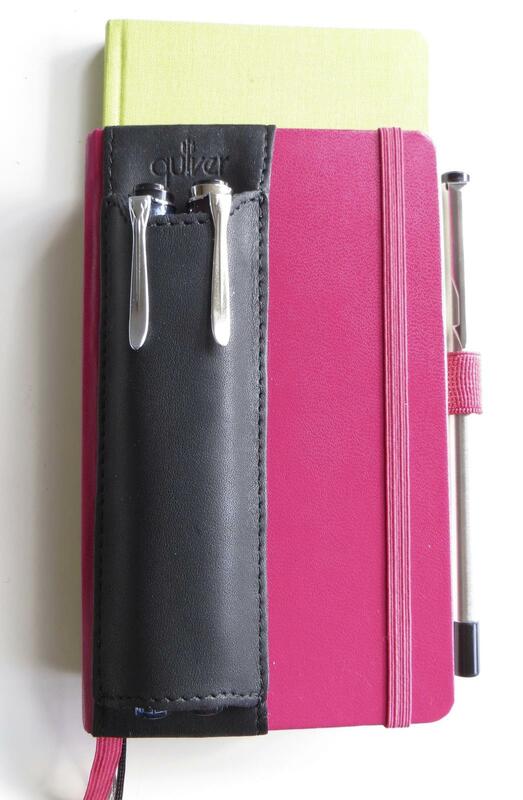 The penloop proved a bit tight for my favourite pens, I needed something better and I love the Quiver on my A5 notebook. I inked up the Pelikan M205 Amethyst with Rohrer & Klingner Scabiosa and the Pelikan M205 transparant blue with Rohrer & Klingner Salix. I love these ink, but, as most iron-gall-inks, they write a bit on the dry side (or should I say, a lot.). At first I had an F-nib on the Amethyst, and that worked great! The transparant blue had an M-nib and Salix gushed out of that one. I don’t know what happened but I found it hard to write with. I swapped the nibs, and Scabiosa still wrote great. Salix, however, decided it did not like the F-nib and decided to go back to non-gusher-very-dry. 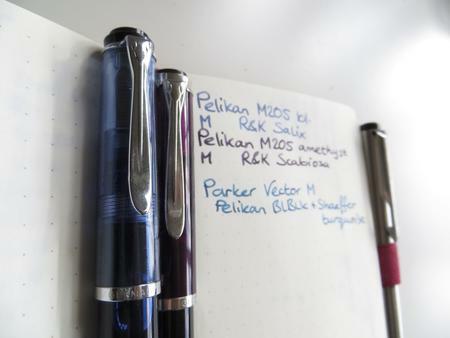 I swapped nibs with my other Pelikan (never hurts to have more, right?) and this time, it seemed more tame. Not sure if the first M-nib has a slightly bigger feed, or I did something weird with cleaning. Both of them now write very nicely with the M-nibs. I inked up the Parker Vector with Pelikan Blue Black (vintage, no idea if it contains iron-gall, it behaves like it) a while back because I read somewhere that the vector plays nice with dry/iron-gall inks. It did play nice! 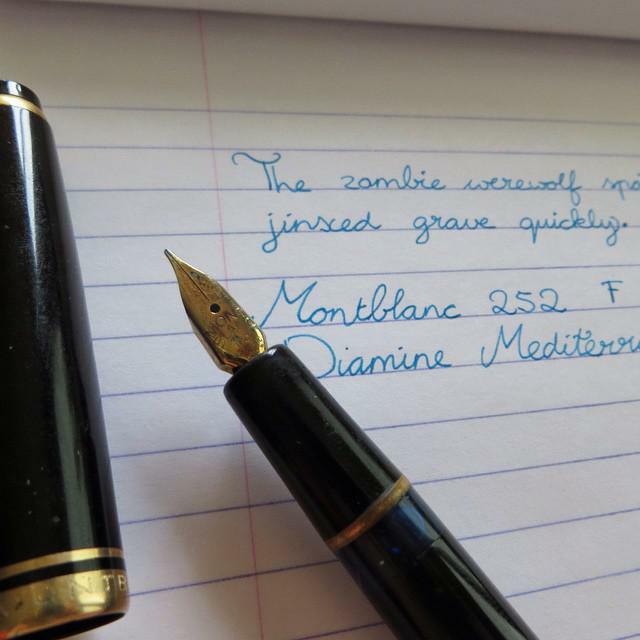 After a while I dumped some leftover Shaeffer Turquoise in the cartridge to bring the blue back into blueblack and it turned into a lovely teal and still writes like a dream. For extra fun, I inked up the Lamy 2000 BB with J.Herbin Emerald Chivor and even that doesn’t bleed through. I’ve used the bulletjournal nearly everyday this year. I keep it simply, I write down a few to-do’s for the day (not too many to prevent overwhelmedness) and I keep track of Nano’s food. I need the defrost it in time, and to aid proper timing I keep a list of what I have in the fridge (= ready to eat) and what I have in the freezer. In the evening I glance at the list and I’ll see instantly if I need to transfer something so the poor dog doesn’t starve due to poor planning on my side. I also keep a list of things I want to buy (to prevent mindless (over)spending) and a waiting-for list for whatever should come in the mail (usually dogfood and vitamins). So far it has worked well, I feel less lost and like having something to - sometimes literally - hold on to. I like the A6 a lot, it can go anywhere with me. I have too many pens. And I have too many inks. 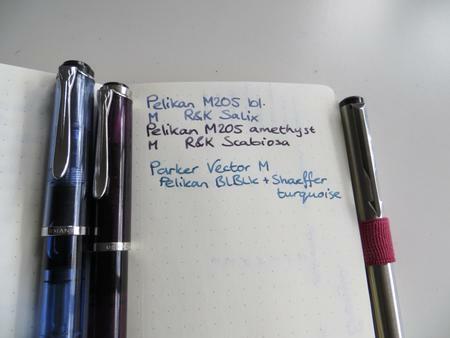 I couldn't keep track of which ink I tried in which pen and if I liked it. 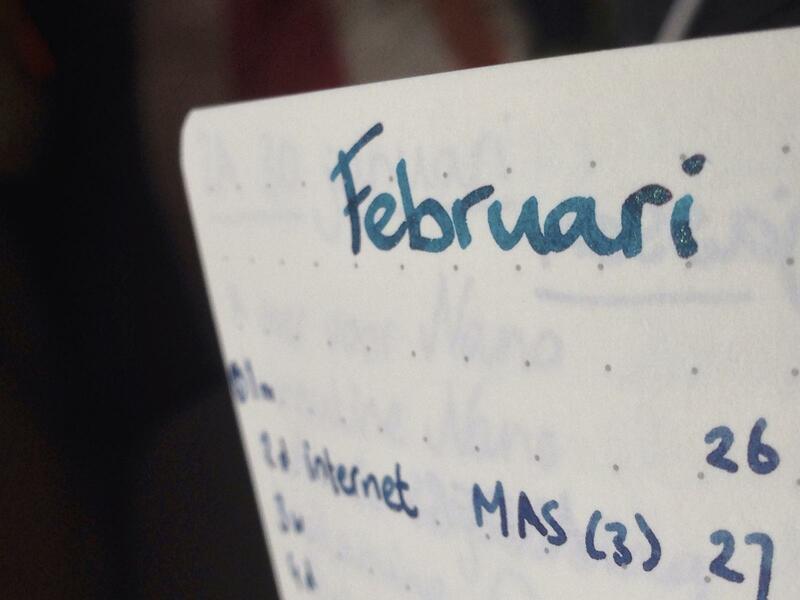 Sure, I made notes in my analogue ink-journal but that didn't work quite as well as I'd like. And suddenly I remembered I had purchased a copy of Tap Forms (a long long time ago for a project that never happened) and I decided to go for it. It took some time but I've come up with a system I like a lot. It consists of 9 forms that link to eachother (a lot).